Majority of provided online maps can be downloaded for offline use (all except the red ones in the list). 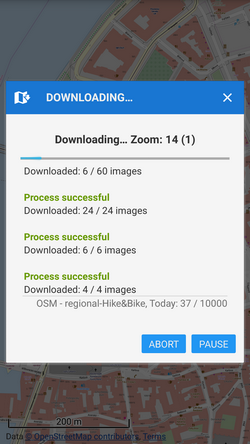 Downloaded maps are stored in Offline tab of the Map manager. tap Download in the Action menu of an online map in the list. This screen - a simple selection of the map area bordered by the screen of your mobile phone or tablet. No other adjustment to the downloaded area is possible. Select area - define your map crop manually by tapping and drawing highlighted points on the border of the green crop area (default is 25×25 kms). Green points move corners of the selection, a magnifier appears when tapping the corners for their accurate placement. If you drag red points, a new points to fine-tune your selection emerge. Thus it is possible to define any shape of the map crop. By country - choose any country in the World and Locus Map centers it in a rectangle crop. Then you continue by the Select area method to fine-tune your selection. Continue… - this item appears only in case you have some unfinished download from the previous session. Locus Map will firstly check already downloaded tiles and then continue with downloading. Draw a new route - by this method you define your track directly in your device by tapping on the screen. Each tap makes a new trackpoint. If you prefer more accurate method, uncheck the Quick add option in the menu and place your trackpoints by shifting the map center and tapping the Add point button. In case you miss you can delete the last added point by button. Width of the area around the track can be easily adjusted by a slider at the top of the screen or more precisely in meters by the button. The trackpoints can be shifted so that you can select your area accurately. When you are satisfied, tap the button and move to the next step - selecting zooms. If not, tap the button and after a confirmation cancel the download-selecting action. Select a track - Available only in Locus Map Pro version. Select a track from your storage to define your download area. The track will be divided into 25 sections that can be further adjusted to meet your requirements. Set the width of the area the same way as in the previous method and confirm. 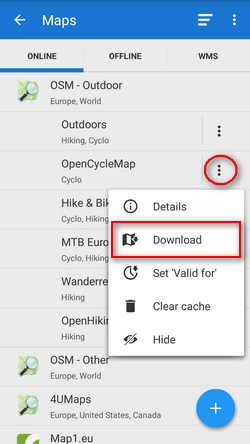 Select a folder - go to your storage and select a folder with points you want to place on the downloaded map. Locus Map creates a rectangle that includes all points in the folder on the map. The rectangle can be shaped as in the Select area method and downloaded. Around points - Available only in Locus Map Pro version. Select a points folder as previously and define a radius around the points which you require to be covered with map. As this is a quite accurate method of defining the map crop, there is no further adjustment available. 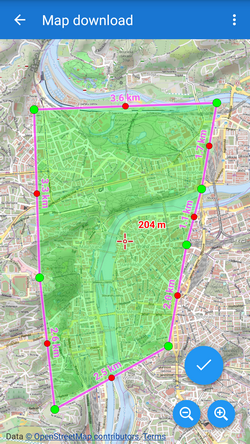 Keep in mind that all maps in Locus Map consist of square tiles of 256px or 512px per side. All downloads work with whole tiles so it is not possible to download precisely round or curved maps - all are composed of square pieces of map. Name of your downloaded map - in some cases Locus pre-fills this field with a near settlement name. When there is just “name of new map”, edit this field or you will be prompted later. It is not possible to proceed with download of a map without naming it. basic options - a slider with zoom limit button and simplified zoom descriptions (cities, streets, houses etc.). Defines only the most detailed zoom limit to download plus everything above. advanced options - a table of available zooms with checkboxes. 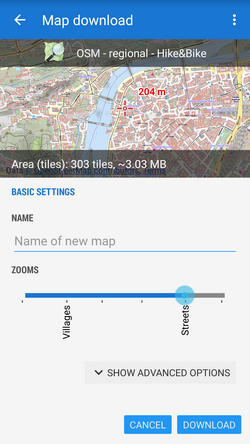 Each zoom level contains information about map tiles number and estimated data size. Allows to define precisely which zooms to download and which not. Versions 2.x of Android operation system can not handle files of 2 and more gigabytes. Keep it in mind when selecting your download area and number of zooms! If you need a bigger map, download more smaller areas, Locus Map will merge them and use them as one file. 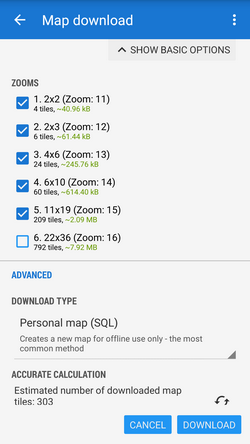 Cached map (SQL) - temporary download into the cache storage space for faster browsing of online maps. Suitable for a quick download before your trip but prone to data corruption. Personal map (SQL) - the most common method creates a new map for offline use only in the Locus/Maps directory. Supplementary download (SQL) - updates or supplements already downloaded map (cached or saved as offline) by additional map tiles. Very useful if you need to increase the area of your map coverage or refresh an obsolete map. Compressed map (TAR) - an obsolete method preserved for users of Trekbuddy and other older systems. Useful also for further post-processing of TAR map tile archives. Overwrite - define how old tiles should be rewritten in case you download cached or supplementary maps. Set “0” if you want to re-load all map tiles. In case you download a paid map Locus Map displays another dialog. 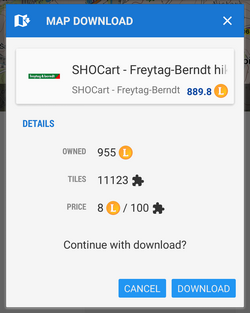 It summarizes your LoCoin credit, final price of the downloaded map, number of tiles in the packet and the price of 100 tiles. If you have enough credit for the purchase there is no other obstruction to begin downloading. A downloading progress info-box emerges after the download is launched. Besides useful information it offers to abort the downloading process (and lose all already downloaded data without possibility to restore the process) or pause it - then the already downloaded data is saved and the process can be renewed from the main download dialog box. When the download is complete Locus Map automatically switches on the Maps manager offline tab where you can verify the map has been downloaded correctly. You will find it in the Locus/Maps directory.